VRV, a fandom-dedicated streaming service, is partnering with Nickelodeon to launch a classic Nickelodeon streaming channel! The service is titled called NickSplat and is available today. The NickSplat streaming channel features a selection of nearly 30 of the network’s most popular nostalgic shows, including All That, Are You Afraid of the Dark?, Clarissa Explains It All, Doug, Kenan & Kel, Legends of the Hidden Temple, Rocko's Modern Life, CatDog, AAAHH!!! Real Monsters, The Angry Beavers and The Wild Thornberrys among others, with additional series set to be added at a later date. Full details about the channel can be found in official press release below. NickSplat is available to purchase a la carte for $5.99 per month, and will be included in the VRV premium bundle for $9.99 per month. Viewers can also sign up for a 30-day free trial. Viewers can visit the NickSplat channel guide to find the latest episodes available by visiting vrv.co/nicksplatguide. Viewers can watch NickSplat on VRV now by heading over to www.vrv.co or downloading the app on Xbox One, PS4, Apple TV, Roku, Fire TV, Android TV, Chromecast, and on Android and iOS. In celebration of the NickSplat channel launch, VRV is taking “childhooding” on tour with a series of experiential events across the US. Kicking off in Santa Monica the weekend of September 7, attendees can enjoy nostalgic cartoons, a cereal bar, a 90’s-themed photo activation and more. Additional events will be announced later this year. San Francisco, Calif. - August 28, 2018 - Your childhood: now streaming! VRV, a fandom-focused video aggregation platform that offers immersive content experiences in a digitally driven environment, has partnered with Nickelodeon to become the premiere launch partner for NickSplat, available as an OTT channel on VRV starting today. NickSplat is a multi-screen destination that includes beloved Nickelodeon content from the 1990’s and beyond across television and social platforms. 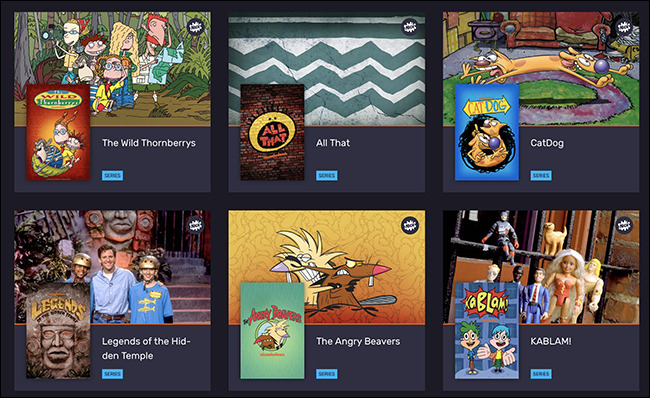 Nickelodeon collaborated closely with VRV to create a NickSplat-branded streaming channel that features a rotating selection of nearly 30 series of Nick’s most popular nostalgic animated and live-action programming. Titles include “AAAHH!!! Real Monsters,” “All That,” “Are You Afraid of the Dark?,” “CatDog,” “Clarissa Explains It All,” “Doug,” “Kenan & Kel,” “Legends of the Hidden Temple,” “Rocko's Modern Life,” “The Angry Beavers” and “The Wild Thornberrys,” among others, with additional series to be added at a later date. NickSplat will be available to purchase a la carte for $5.99 per month, and will be included in the VRV premium bundle for $9.99 per month. VRV – the premiere launch partner for NickSplat – and Viacom will curate programming on the channel throughout the partnership. Viewers can visit the NickSplat channel guide to find the latest episodes available by visiting vrv.co/nicksplatguide. Viewers can watch NickSplat on VRV now by heading over to www.vrv.co or downloading the app on Xbox One, PS4, Apple TV, Roku, Fire TV, Android TV, Chromecast, and on Android and iOS. VRV launched in 2016 to build fans a better universe through a premium, bundled streaming experience. The platform collaborates with both digital-first and traditional media brands and currently offers 12 channels in the VRV Premium bundle including NickSplat, Crunchyroll, Funimation, Rooster Teeth, Shudder and more, alongside exclusive series like “HarmonQuest,” “Killjoys,” “Thundercats,” and “Gary and His Demons” for a monthly subscription of $9.99. Ellation is the parent company of VRV and sister-platform Crunchyroll, and is a part of the Otter Media portfolio. VRV is a leading fandom-focused aggregation platform featuring premium SVOD channels including Crunchyroll, Funimation, DramaFever, Rooster Teeth, and Shudder, alongside a curated house channel, VRV Select. Created to provide fans with a next-gen entertainment experience, VRV offers immersive content experiences in a digitally-driven environment via bundled subscription, a la carte subscription, or ad-supported options. As a platform, VRV helps partners extend their reach and distribute their premium content through a high-quality, branded experience on mobile, web, and popular living room devices. Ellation, Inc. is a transformative entertainment company and home of industry-leading brands Crunchyroll and VRV. As part of Otter Media, a unit of WarnerMedia,Ellation operates at the intersection of technology and media to redefine the next wave of media interaction and consumption -- breaking down barriers to content experiences for passionate fans around the world. Ellation’s offices in San Francisco, Los Angeles, Tokyo, and Chișinău develop the product, design, engineering, marketing and content that brings our communities of passionate fans together. NickSplat is a multiple-screen destination, spanning television and social media platforms, dedicated to the most loved Nickelodeon content from the 1990’s and beyond. Celebrating the characters and shows that are definitional to millennials who grew up in the ‘90s, NickSplat consists of landmark Nickelodeon series and classic programming stunts; and a robust social media community on Facebook, Instagram, Tumblr, Twitter and YouTube platforms. In a separate interview, Berman told AdWeek “We’re so excited for our next phase for VRV, looking at this space and how channels fit our mold and working to bring them on,” said Eric , head of content partnerships, VRV, Ellation. To celebrate the release of the programming, VRV will also host a “Childhooding Zone” which will be open to the public in Los Angeles and New York later this year. The zone will feature nostalgic cartoons and a cereal bar. VRV is also launching a campaign to send ’90s-themed snacks—such as Kool-Aid Jammers, Gushers, Airheads and Teddy Grahams—to fans who tweet with the hashtag #ChildhoodingWithVRV. Moothart explained that they will work with social media influencers to drive awareness for the events, as well as encourage use of the official hashtag #ChildhoodingWithVRV on social media. After its appearance in Santa Monica, the Childhooding Zone will travel across the country, where it will be installed outside of New York Comic Con. Nickelodeon isn’t the only one delving into new territory with this partnership. This activation will mark the first time Ellation has created a dedicated, stand-alone event outside of an existing event or partnered with marketing delivery service Fooji. “We wanted to create a place that physically embodied a fan’s childhood and deliver that nostalgia in an impactful way,” Moothart said. The marketing campaign for NickSplat purposely sticks to those who grew up with the content, Moothart explained. "Our strategy for VRV is predicated upon selectively adding meaningful channel brands to the VRV service, and our next phase of partnerships is focused on working closely with proven traditional networks to bring them into SVOD, just like we are doing with Viacom for Nickelodeon," said Eric Berman, head of content partnerships, VRV. "We have a unique expertise in launching and operating SVOD services, and we intend to share our streaming know-how, our robust technology platform, distribution relationships across all major devices, and our young and engaged audience who has a proven willingness to pay for content, with our partners, to jump-start their SVOD efforts." Originally published: Tuesday, August 28, 2018. H/T: ToonZone Forums PinkiePie97; Sources: Entertainment Weekly, Forbes, Polygon, Crunchy Roll, Mashable, Newsweek, How-To-Geek.